Golden Helix is excited to host a webinar on Tuesday August 26th discussing the Genomic Prediction methods which were recently integrated into the SVS software. 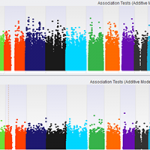 Genomic prediction uses several pieces of information when calculating its results. Genetic information is used to predict the phenotype or trait for the individuals. The phenotypic trait data can be provided for a subset or for all of the individuals being studied. The genomic prediction model (a single mixed model regression equation) also uses the contribution of each genetic loci to build the model, as well as to solve for EBV and ASE. EBV stands for estimated breeding value of individuals. This prediction is very important in helping researchers determine which animals or plants to continue breeding due to high estimated breeding values for desired traits such as milk production, weight gain, and marbling or increased yield. ASE determines the allele substitution effect for genetic loci. Essentially the alleles that associated with the trait have the most influence on the model, leading to a useful biomarker or by identifying associated genes. The ASE parameter functions as one of the main criteria for improving animal breading. There are four main ways of utilizing genomic prediction. In the first case EBV is predicted for all individuals. All individuals are used in the training set and individuals with the highest EBV should be considered for carrying forward in breeding programs. The second way is to predict EBV for subsets of individuals. In this example, training sets will include all individuals with any known phenotype information. The phenotype and ASE data is then used to predict missing phenotype information using the genetic information for those individuals. Another way to use genomic prediction is to use training and validation sets to gauge the accuracy of a prediction model. Researchers will randomly select a subset of individuals to act as the training model, the remaining individuals will then be set to be missing a specific phenotype (also known as a validation set). The model built from the training set solves for the phenotypes and EVBs of all the individuals. The predicted phenotypes are compared to the actual phenotypes for the validation set. The final way to conduct a genomic prediction is by identifying the loci that have the most significant effect on the model. In this case all individuals with phenotype data are entered into the training set. Then researcher investigates ASE on each loci to identify the loci with the largest normalized ASE. Genomic Prediction is quickly becoming one of the most used tools for researchers interested in milk production, weight gain, and marbling or increased yield. Tune in August 26th at 10AM MDT to get the full scoop! I have tried SVS for genomic prediction. I have tried the GBLUP and BayesCpi methods. However, I could not figure out how to calculate the prediction accuracy using SVS. I was just able to visualize the accuracy by ploting the scatter plot of the predicted data test set against the actual phenotype. Does SVS provide an option for accuracy calculation?